Many people choose to clean their own carpets because they think it’s an easy job and that it will cost less. While it may save some money, there are dangers that come along with cleaning your own carpets. Those that believe it’s a better idea to clean their carpets themselves are the ones that fall victim to the hidden dangers that come with taking the task on yourself. These dangers can damage your carpets affect your family’s health with the germs and bacteria that can be left behind. The results between DIY and professional carpet cleaning are clearly noticeable-and the dangers that come with DIY should be noted. 1. Mold buildup. Mold can be dangerous to the heath of your family and is one of the dangers of DIY carpet cleaning. People that are allergic can develop asthma, allergy symptoms or even respiratory infections. Other symptoms include sneezing, runny nose, red eyes and skin rashes. Mold can also stink and corrode carpet fibers. 2. Carpet discoloration. This can happen when carpets are left too wet and happens a lot with DIY carpet cleaning. Carpets that are left wet can also shrink. Many of the solutions that come with rented machines contain oxidizing agents like bleach or ammonia that can strip the color from your carpet. 3. Poor cleaning results. Properly cleaning your carpets is important and the quality with doing it yourself don’t compare with professional cleaning. The cleaners you rent aren’t as powerful as professional ones and can’t get you the same results with cleanliness, safety and keeping carpets free of mold and germs. You’ll be disappointed with the results and your carpets may still look dirty or stained. All this after hours of back-breaking work! 4. Carpet delamination. When carpets get too wet, delamination can occur. Carpet delamination occurs when the secondary backing of the carpet separates from the primary backing. While this can happen with poor bonding agents, many time sit happens from improper cleaning methods. 5. Overly wet carpet. Rented machines aren’t as powerful and professional ones. This will leave your carpets too wet and leave a “damp fabric” smell behind. 6. Voided carpet warranties. You may also discover you have voided the warranty on your carpet when you’ve cleaned your carpets yourself. Not a risk you want to take. Once carpets are damaged, there won’t be much you can do. The only solution is to live with them or replace them. While rented machines look easy to use, you’ll need to move the furniture, treat stains, lift the machine and constantly change out the solution and water. Not the way you want to spend a few days off! 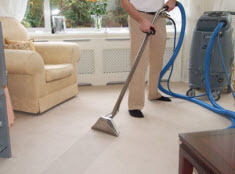 If you want your carpets cleaned the right way the first time, then hire professionals. Experts use the best stain removers and industrial strength cleaners that deliver superior results. To avoid the hidden dangers associated with DIY carpet cleaning, contact Leading Carpet Cleaning today to schedule an appointment. 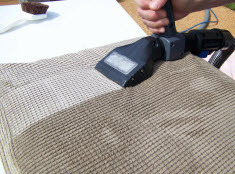 How to Deep Clean Fabric Sofas in Riverside, CA; Vacuum, Treat Stains & Call an Upholstery Cleaner! Exposed to daily and frequent use, the sofa is one of the major furnishings that see a lot of buildup. The sofa can quickly look rough with the family, pets, and guests comings and goings. They are susceptible to accumulating dirt and debris, odors, germs, bacteria, and pet hair. In order to keep your sofa in optimal condition, looking its best as well as efficiently cleaned, sanitized, and deodorized, professional deep cleaning is recommended 1-2 times a year. However, in between the deep cleaning and stain removing professional care, you can perform your own maintenance. With your maintenance in addition to professional maintenance, your sofa can be kept in prime condition through its expected lifespan and maybe even beyond with proper care. With that in mind, we at Leading Carpet Cleaning would like to share some tips on maintenance. How Do You Deep Clean a Couch? 1) The surface of the sofa needs to be vacuumed. Remove the excess dirt and debris presently found on the surface of your couch using your vacuum cleaners hose, and all of the attachments. Before treating any stains, it is important to vacuum the filthy debris first, otherwise you will have a messier time. Vacuuming your sofa should be done weekly. So you do not damage the fabric, especially if you have leather upholstery, avoid using any abrasive tools. Keeping as much of the fallen remnants from penetrating the surface will minimize the dingy and dull effects the dirt and debris can do to a sofa. 2) Use the right sofa cleaners. Before initializing any further cleaning and treatment processing to your sofa, read the label carefully. Specific instructions are often found there because different fabrics require specific needs. If you prefer to buy upholstery cleaner, be sure the products are conducive to what the tag recommends. You should ensure the cleaner is safe on the fabric while still effectively killing the germs and bacteria and removing the dirt spots and stains. If ever in doubt, always perform a patch test in an inconspicuous area to make certain the upholstery will not be compromised. 3) Consider homemade cleaning solutions. If the label does not indicate a specific type of cleaner, and you prefer DIY formulas, a mixture of baking soda and vinegar can loosen compacted dirt, remove stubborn stains and neutralize odors. If you prefer working with a paste, you will want more baking soda but otherwise two parts white vinegar and 1 part baking soda used until the baking soda is dissolved should do the trick. However, use a dab of rubbing alcohol on a cotton ball to dab away stains on leather sofas. When using cleaners to kill the germs, or remove stains and odors; never over saturate when applying it onto the sofa. Too much wetness can cause water damage effects. Never rub or scrub the stains but blot them out and avoid using cloths that have dyes because could transfer to the sofa. When it comes time for the heavy duty cleaning of your sofas, call Leading Carpet Cleaning and let our trained professionals get your sofa looking vibrant and smelling fresh again. Carpet is a big investment in your home and taking care of it will protect that investment. We all want a fresh home for spring and having your carpets professionally cleaned is great way to help. 1. Get rid of trapped pollutants in carpet. Many times, the air in our homes is worse than the air outside. Carpets that are dirty can hold on to indoor air pollutants like pet dander, roach allergens, dust, dirt and particle pollutants. It’s gross to think about. Air borne gases that are toxic can stick to these particles and get trapped in carpets. To ensure deeply trapped pollutants are removed, you need to hire professional carpet cleaners. Doing so will remove stains and dirt to prolong the lifespan of your carpets. This keeps more money in your pocket. 2. Get rid of dust mite infestations in carpet. Dust mite infestations are easy to overlook because they are microscopic. Dust mites will leave feces and body part behind. Again, gross. These are so easy to inhale when areas are cleaned and will cause existing allergies to flare up. Professionals use hot water extraction that will kill dust mites. This is a good thing. 3. Prevent mold growth in carpet. When areas have high levels of humidity, dirty carpets can create the perfect place for mold to develop. Moisture gets into our homes and can seep into our carpets. Hot water extraction will remove dirt and dust mites without leaving moisture behind. The drying process is almost eliminated with professional equipment and carpets are usually totally dry within a few hours. 4. “Green” carpet cleaning solutions are available. If you want to go with less chemicals during the cleaning process, then chose a professional company that offers certified product to clean your carpets. These products are safe for all types of carpets and won’t pollute the environment. 5. Get customer satisfaction. Always hire companies that are licensed, insured and bonded. Use a company that will give you a quote and a guarantee that you’ll be happy with their services. 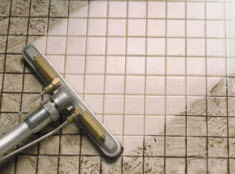 Hot water extraction is the is the most effective carpet cleaning method. Your home will be a healthier place to live and will look and feel better too. After you’ve finished all the dusting, scrubbing and decluttering that comes with spring cleaning, call Leading Carpet Cleaning to get the carpets cleaned. Easter egg dye is commonly found in many households during this time of year. The artsy project, whether you do it yourself or let the kids have at it, creates splatters, drips, splashes, and spills which typically land anywhere in the proximity. Walls, carpets, tile, rugs, wood flooring, linoleum, upholstery, and other such places are subjected to contact with Easter egg dye. If you respond quickly and depending on the surface, you can quickly wipe it away before it stains. However, porous materials and time could cause the dye to become a stain. With the help of hydrogen peroxide, you can lift the dye out of these surfaces but there are precautions you must take when using hydrogen peroxide. At this time, we at Leading Carpet Cleaning would like to discuss using 3% Hydrogen Peroxide to remove the Easter egg dye around the house. 1) It is important to perform a patch test on any surface you use peroxide to remove the dye. Hydrogen is a bleaching agent that will strip color from the areas you are treating if it left on long enough or the potency is strong. Dab peroxide in an inconspicuous area for five minutes to ensure it does not lighten the surface you are treating. 2) For easy application, pour the peroxide in a clean, empty spray bottle. If you do not have one, you can sponge the peroxide on with a cotton ball or white cloth. 3) For up to five minutes, let the peroxide sit on the dye. Be especially diligent on surfaces that do not do well with moisture exposure such as wood flooring to avoid ill effects. Additionally, be cautious on the non-sealed materials. Do not leave the peroxide unsupervised. 4) To get into the crevices of textured surfaces, use a toothbrush soaked in hydrogen peroxide to work the hard to reach them. Hard surfaces such as walls, tile, wood floor, linoleum, etc can be wiped clean and the areas that are fabric such as carpets, upholstery, rugs, etc. should be blotted with damp white cloths. After the dye is absorbed into the rag, follow up with a damp cloth. 5) Use soapy water to dampen another cloth to make sure the peroxide residue is thoroughly removed from the surface. Rinse clean with a water damp cloth. 6) Make sure the treated areas is completely dry. 7) Repeat until dye is removed. 1) If you are unclear how long to leave the hydrogen peroxide on the dye, err on the side of caution and do not exceed 5 minutes. If it is left too long you can permanently lighten the color of the surface you are treating. If you remove it too soon a simple reapplication can be done easily enough. 2) Hardwood floors that are not adequately sealed may require a bit of sanding with fine grit paper until the dye is gone. Afterwards, you will have to stain and refinish the area. If you do not know how to do this, we recommend a professional service to ensure you do not damage your wood floor. 3) Pre-dampening a clean cloth with water and then applying peroxide to the damp cloth to scrub the Easter egg dye away can help you avoid water marks on hardwood flooring. Be sure to use different areas of the cloth as the dye transfers to the cloth and make sure the wood floor is completely dry. 4) Only blot carpets, rugs, and upholstery do not wipe; scrub or rub the stain. The area should be damp, not wet; over saturation can cause moisture damage. Never use hot water when treating the dye and only use white rags, cloths, or towels. If the Easter egg dye is proving to be a challenge, call Leading Carpet Cleaning to remove the Easter egg dye from the various surfaces and our experts will get it done. Contact us today!